I am a Masters student with a focus in Archaeology. 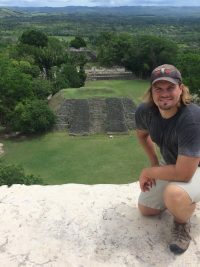 My research interests are the Maya lowlands and remote sensing techniques. My advisor is Dr. Lisa LeCount and I will be working with her at the site of Actuncan, Belize excavating anomalies identified through analysis of magnetometry data. I received my first undergraduate degree in Finance from The University of Alabama in 2007. I worked as a financial advisor and then a construction superintendent before returning to college in 2015 to attain a degree in Anthropology.